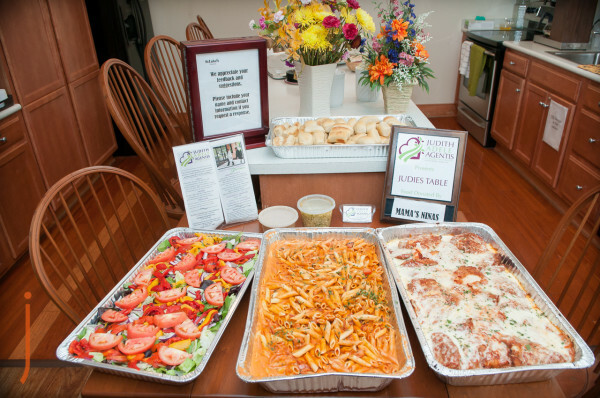 Mama Nina’s of Main St Bethlehem Donates to St Lukes Hospice House. On Saturday, September 1, 2018, All proceeds from cars washed at Saucon Valley Auto Spa will benefit hospice meals. All proceeds from every car wash, in either the touch-free auto bay or self-serve stations, will benefit JAACF, a Lehigh Valley-based 5013c. 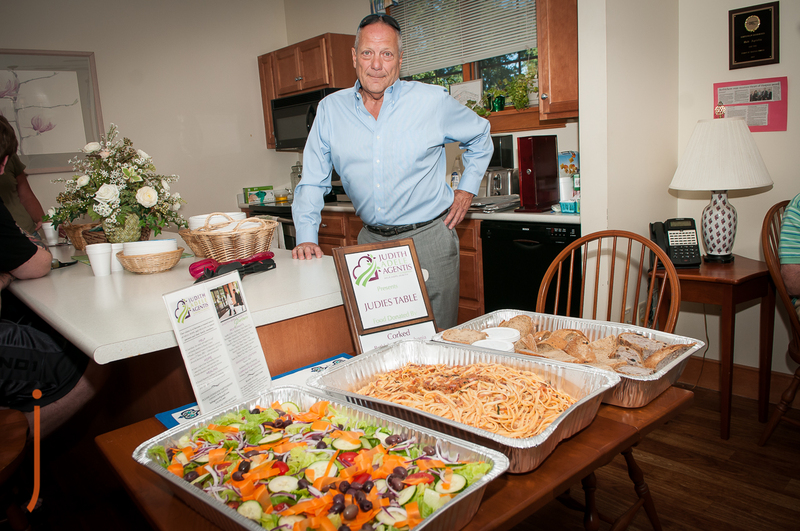 Since 2013, JAACF has delivered more than 15,000 meals to St. Luke’s Hospice House. Additionally, the non-profit provides early cancer detection education and outreach. For more information about the Judith Adele Agentis Charitable Foundation, visit www.jaacf.org, or on Facebook or Instagram. Email is ba.jaacf@gmail.com or phone 610-392-5460. Saucon Valley Auto Spa is located at 3510 Route 378, Bethlehem, PA, 18015, just south of the Route 78 underpass. For more information about Saucon Valley Auto Spa visit www.sauconvalleyautospa.com, on Facebook or on Instagram. The Judith Adele Agentis Charitable Foundation (JAACF.org) is entering its fifth year of fulfilling its mission. Our upcoming annual dinner gala allows guests, friends and the public to become informed of compelling stories of early cancer detection. Expansion of our mission into a goal of providing financial assistance for screening costs. With your help this year, the Judith Adele Agentis Charitable Foundation will continue to be a trusted source for HELP, HOPE and HEALING. Your sponsorship will enable us to continue to serve. JAACF is a 501 (c) (3) Tax Exempt Charitable Organization. Your generous contributions are exempt from Federal and State Taxes. Your donations may be mailed to JAACF, PO Box 22075, Lehigh Valley, PA 18002, or made at jaacf.org/donate. Exclusive sponsorship levels for our upcoming fundraising dinner event, “Raising High Notes” at Blue Event Center, PA on Saturday March 24, 2018 starting at 6 PM. Please consider supporting this event by purchasing one of our dinner sponsorship packages. Your company logo receives highest prominence year round on all promotional materials, newsletter, social media, digital and local media coverage. Two full page ad in event booklet. Emcee will deliver a welcome message about your business; exhibit table with company banner and marketing materials; special photo opportunity with JAACF Board of Directors. Ten complimentary tickets with choice seating; choice of 10 fine jewelry items from the “Judie’s Heart” collection created exclusively for donors of JAACF org. Your company logo receives prominence year round on all promotional materials, newsletter, social media, digital and local media. Full page ad in event booklet. Emcee will deliver a welcome message about your business; exhibit table with your company banner and marketing materials; special photo opportunity with JAACF Board of Directors. Ten complimentary tickets with choice seating for the event; ten fine jewelry items from the “Judie’s Heart” collection created exclusively for donors of JAACF org. Logo on promotional materials and social media; sponsor banner and exhibit table; Logo at event and on all marketing materials. ¾ page ad in booklet. Recognition in digital and local press coverage. Emcee mention at event. Professional photos at event. Recognition on JAACF website and social media channels. Eight tickets and preferred seating for event. 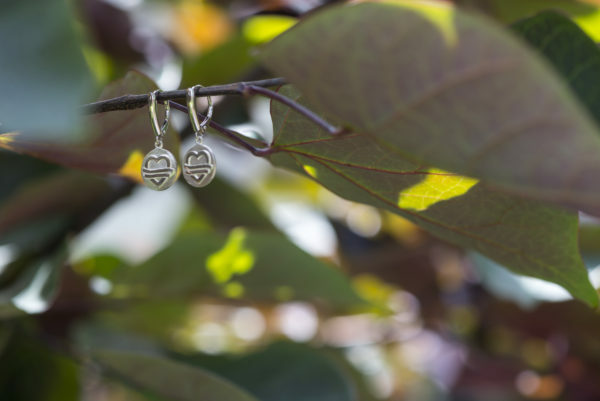 Eight fine jewelry items from the “Judie’s Heart” collection created exclusively for donors of JAACF org. Logo on promotional materials and social media; 1/2 page ad in event booklet; sponsor banner and exhibit table; Logo at event. Professional photos at event. Four tickets and preferred seating for event. Mention in event booklet. Two tickets to the event. For more information or to secure your sponsorship, call Bob Agentis at 610.392.5460, email ba.jaacf@gmail.com, or check your desired level and return with payment to: JAACF, PO Box 22075, Lehigh Valley PA 18002. JAACF is a 501 (c) (3) charitable organization and donations are tax deductible as allowed. Reaching High Notes, the Judith Adele Agentis Charitable Foundation (JAACF) annual dinner gala will be held Saturday, March 24, from 6 to 10 p.m., at Blue Event Center. Tickets are $95 per person and include passed hors d’oeuvres, a three-course dinner featuring filet mignon with signature crab cake, roasted vegetables, a vegan option, and layered opera cake. For tickets, click https://whennow.com/event/reaching-high-notes. Musical entertainment will highlight hits through the decades. During the cocktail hour, acoustics by 3AM will perform, in addition to a special appearance by the Bombshell Sisters. Luxury auction items and a special speaker will round out the evening’s offerings. After dinner, Billy Murnin and the band Not Quite Right, formerly of Uproar, will entertain with a medley of dance tunes. The Judith Adele Agentis Charitable Foundation was the recipient of the PA Hospice Network Heart of Hospice Award in 2014 and was awarded the Shining Star Award from St. Luke’s Hospital Network that same year. In addition to meals, JAACF provides funding for early cancer detection education for pancreatic, liver and colon cancers. “We depend on the generosity of local businesses, restaurants and donors,” says Agentis, who has delivered 90 percent of the meals JAACF provides weekly and spends time with the family members when possible. There are currently more than 40 participating restaurant donors to JAACF. Going forward, the nonprofit is looking to garner new and additional Lehigh Valley restaurants as annual or semi-annual donors. Interested restaurants can reach Bob Agentis at ba.jaacf@gmail.com to find out more about being part of the meal program. For more information, visit JAACF.org; find us on Facebook; or email us at ba.jaacf@gmail.com. The mailing address for JAACF.org is P.O. Box 22075, Lehigh Valley PA 18002. 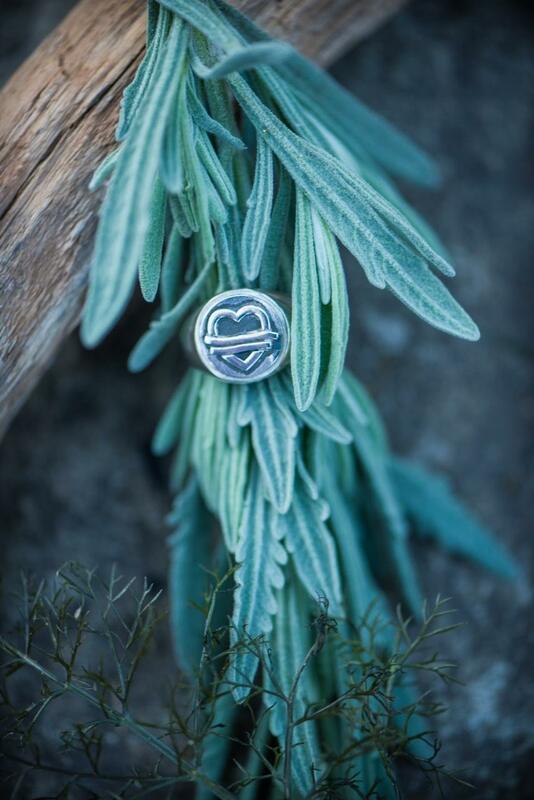 BETHLEHEM, PA — The Judith Adele Agentis Charitable Foundation (JAACF) will unveil a seven-piece collection of fine jewelry handcrafted in sterling silver and gold. An opening launch party and a chance to meet the jewelry collection’s designers will take place on Saturday, December 9, from 1 p.m. to 4 p.m. at Musselman Jewelers, 420 Main Street, Bethlehem, PA. Sales will benefit the Lehigh Valley–based nonprofit, which has delivered more than 12,000 nutritious, comforting meals to families with loved ones in hospice since its founding in 2013. JAACF Founder and Chairman Robert Agentis co-designed the collection in collaboration with Designer and Bench Jeweler for Musselman Jewelers Randi Keeler-Sigafoos. 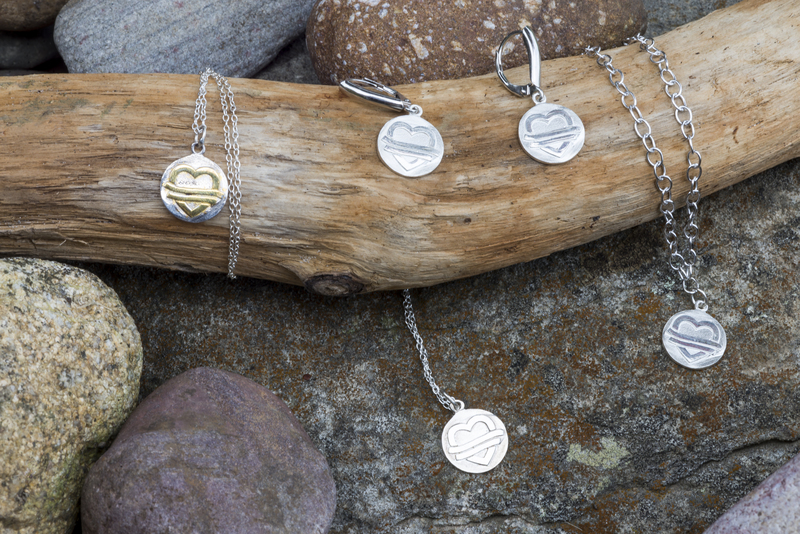 The Judie’s Heart Collection includes earrings, necklaces, rings, a charm bracelet, cuff links, and a pendant. Each piece includes the signature design JAACF uses as its logo, two ribbons entwined with a heart (a registered trademark). Each handcrafted piece will be dated and registered by Keeler-Sigafoos. “We wanted to create a line of stylish, wearable items that evoke serenity and symbolize the eternal bond of love ones,” says Agentis. The collection will be available at Musselman Jewelers, select retailers and online at www.jaacf.org. Jewelry is available with a donation to JAACF starting at $125.00 (price list attached below). Monies raised will be earmarked for early cancer detection education and testing for the underinsured as well as for hospice meal donations. A recipient of the PA Hospice Network Heart of Hospice Award and the Shining Star Award from St. Luke’s Hospital Network, JAACF.org was established to provide meals to families holding vigil at St. Luke’s Hospice House and to fund early cancer detection education and testing for pancreatic, liver and colon cancers. Visit www.JAACF.org, find us on Facebook or email us at ba.jaacf@gmail.com for more information. Donations over $125.00 to JAACF.org to support hospice meals will earn donors a signature, fine jewelry creation. Necklace with 18-inch sterling chain. Necklace with 14k yellow gold plating and 18-inch sterling silver chain. Bracelet with sterling silver charm. 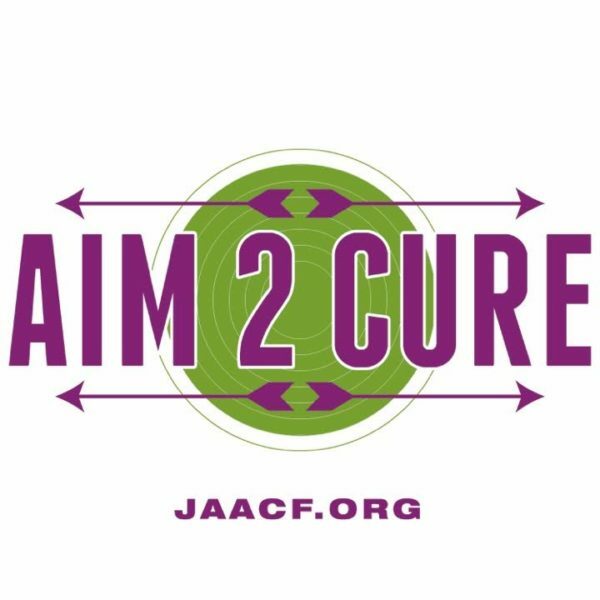 Aim2Cure 2017, a sports shooting target competition will be held Sunday, Oct. 15. LEHIGH VALLEY (Immediate Release) — Calling all archery and sports-shooting enthusiasts! All ages and abilities are welcome to participate in the 2017 Aim2Cure Archery and Handgun Competition. The sporting event, which benefits the Judith Adele Agentis Charitable Foundation (JAACF), a Lehigh Valley–based nonprofit that delivers meals to families holding vigil for loved ones in hospice, will be held Sunday, October 15, from 2 p.m. to 6 p.m. at The Heritage Guild, 70 Hilton Street in Easton, Pennsylvania. Registration for new event participants begins promptly at 2 p.m. Returning marksmen and markswomen may register starting at 2:45 p.m. Instructors and range officers will be present to assist all participants throughout the competition. An awards ceremony will take place immediately following the competition. A prize for highest combined bow and handgun score will be awarded. Highest bow score and highest handgun score will also be awarded. Second-place winners will receive awards, as well. “We are looking forward to a fun and challenging day of competition for all participating sportsmen and sportswomen. We welcome all skill levels and ages,” says Bob Agentis, founder and chairman of JAACF. Tickets are $45 per person. Refreshments, appetizers and beverages will be served. For tickets and additional information, go to https://whennow.com/event/aim2cure-archery-and-hand-gun-competition. For more information, email BA.JAACF@gmail.com. Checks for $45 per person should be made payable to JAACF.org and sent to: JAACF, P.O. Box 22075, Lehigh Valley PA 18002. The JAACF fills a need: Since 2013, the 501(c)(3) has delivered for more than 10,000 meals to family members of patients at St. Luke’s Hospice House. Judith Adele Agentis Charitable Foundation was the recipient of the PA Hospice Network Heart of Hospice Award in 2014 and was awarded the Shining Star Award from St. Luke’s Hospital Network in that same year. In addition, the organization provides funding for early cancer detection education and testing for pancreatic, liver and colon cancers. For more information, visit JAACF.org; find us on Facebook; or email us at ba.jaacf@gmail.com. BETHLEHEM, PA (APRIL 11, 2017) – A Global Dinner Gala, to benefit the Judith Adele Agentis Charitable Foundation, brought 125 guests out to a lively evening of entertainment, international cuisine and auction items at Blue Event Center, on March 16. The gala helped raised funds for early cancer detection education, and hospice meals. 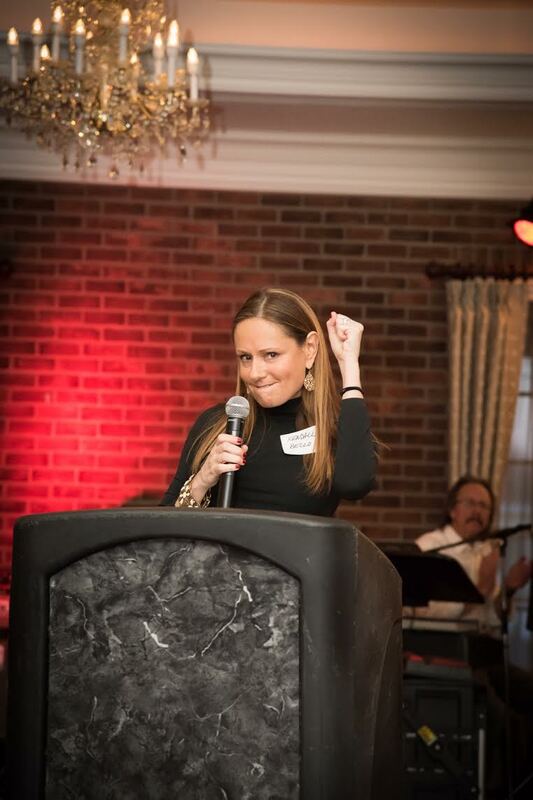 Ashely Russo of ASR Media and The Peak TV served as emcee. Featured guest speaker was Kendall Bello, a resident of Yardley, PA in Bucks County. Kendall is a mother, wife, daughter, avid equestrian, friend, and recent colon cancer survivor. Her poignant speech earned a standing ovation. Here, is what she told the guests about why she believes early detection cancer testing is paramount. “I’m here to tell you why early detection is so important. I’m living proof that waiting until the recommended time for a colonoscopy, which is fifty years of age, may for some people, be too late. Personally, I saw no need to have testing before age fifty since there was no prior history of colon cancer, or any cancer at all in my family history. On June 7th, 2015, I was experiencing a bowel obstruction causing me to visit St. Mary’s Medical Center emergency room. At that time, I was sent home with instructions to follow hoping it would resolve the problem, unfortunately it did not. I went back to the emergency room the following evening, and again I was sent home with more instructions to follow. To no avail. Nothing was resolving the issue. That evening I received a phone call from a doctor at St. Mary’s whom I had never met or had seen in the ER. She said that she had come across my chart and that I needed to come back to the hospital ASAP. Upon arrival they began a series of testing. One of which was a CAT scan, which came back showing no obvious cause. The next test was a colonoscopy which identified a cancerous tumor. The doctors explained the situation to my husband and me, which unfortunately I did not fully comprehend. At this point, I was very weak and a little disoriented due to being obstructed for a week. There were various opinions among the doctors on how to proceed. It was Dr. Goldstein, head of the Colon Rectal department, who decided that I needed emergency surgery. The surgery lasted five and a half hours to remove a cancerous tumor in my colon and insert an ostomy. Upon awakening, my life as I knew it was drastically changed. Not only fully understanding at this point that it was a cancerous tumor which was stage 2A, but that I would be living with an ostomy for the next seven months. It was a lot to absorb both physically and mentally. The good news was that the tumor had not broken completely through the colon wall and was not present in any other organs. The tumor was uniquely located, and that is why it was not showing up on any of the scans. Since the surgery was very extensive I was very weak, so my doctors decided it was best to leave the wound open to heal verses going back into surgery again to close it. So, after two weeks in the hospital, I was sent home with a Wound Vac which is a machine that is attached to the incision to help the wound heal faster. The wound remained open for three months until it finally healed. I had nurses three to four times a week, coming to our home to change the dressing for the next three months. Simultaneously, I had the decision as to whether or not to undergo chemotherapy. Since there is no conclusive research as far as stage 2a colon cancer goes, it made the decision that much more difficult. Ultimately, I decided to proceed with the chemotherapy for six months, with infusions every other Monday. Going into the chemo, I wasn’t aware of how relentless it was going to be to go through the 2 week cycles. Essentially, I felt sick for the first week and a half after each treatment, then had a couple of good days and went right back into the cycle again. After six months of that and the initial surgery, somehow I made it through. Post chemo, in February of 2016 I had surgery to reconnect the colon which also meant removing the ostomy which meant I was beyond thrilled. However, I didn’t realize what a tough recovery that would be. It took my colon quite a while to “wake up” as they say, and then came the long haul of figuring out what I could and could not eat to avoid the major pain that it sometimes caused. I then was diagnosed with post surgical hernias in the fall of 2016. I had the hernia surgery this past January 30th 2017. The recovery was about six weeks which leads me to today. I am cancer-free and have been given the green light to be able to ride my horse and get back into training and competing. I also would like to mention a very important aspect to all of this as well. This disease not only effects the person that is diagnosed, but effects the family members in a very traumatic way. To see how difficult it was for all of them broke my heart. My husband, mother and father were there with me through this entire ordeal which I could not have done without them. To watch my 10-year-old son watch his mother go through this is something that I hope no one has to experience. I can’t stress enough how important it is to get a colonoscopy by 50, however I’m an advocate for getting one in your 40’s if possible based on my on experience. I was very happy to see a couple weeks ago that The Washington Post reported about a study that was published February 28th in the Journal of the National Cancer Institute which indicates colorectal cancer rates are rising sharply among Gen X and millennials. One conclusion in that study is that colonoscopy guidelines need to be re-examined based on the increase in incidents in people under fifty. I want to thank my medical team at St. Mary’s Hospital, and Dr. Richard Goldstein head of the colon rectal department, Dr. Dan Lebovic my oncologist, and everyone in-between who helped save my life. I also want to give a big thanks to Tina and Bob Agents for running such a wonderful foundation and hosting an amazing event. Bringing attention to how important early detection is in saving lives and providing meals and support to the families with loved ones going through treatment and fighting this terrible disease could not be a more noble cause. For blessing me with a tumor that obstructed which led to early detection, resulting in discovering it prior to when the stages would have been more dangerous. For keeping the tumor in my colon and not allowing it to spread into other organs. For allowing the surgeons to be able to remove the entire tumor safely. For allowing my colon tissue to be strong enough for the surgeons to reconnect it. For allowing me to get through the chemotherapy. And finally, for allowing me to stand here before you as a cancer survivor. I choose to be thankful to God. The Judith Adele Agentis Charitable Foundation is a Lehigh Valley–based 5013c nonprofit. For more information, email ba.jaacf@gmail.com, visit www.jaacf.org, or call 610-392-5460. Follow on Facebook at JAACF org, or Twitter at @Jaacforg. 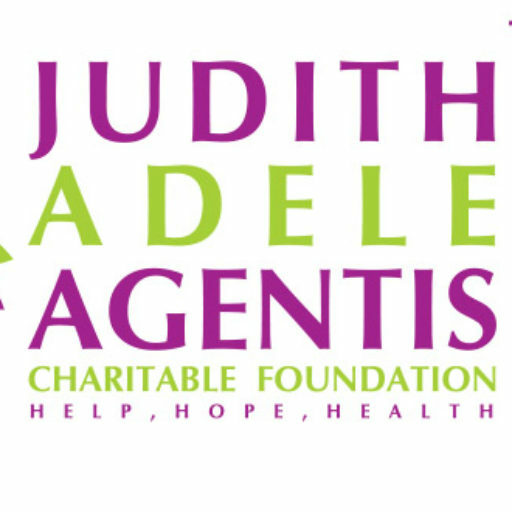 The Judith Adele Agentis Charitable Foundation (JAACF) was founded in memory of Judith Agentis, a wife, mother, and grandmother who lost her battle with pancreatic cancer on January 10, 2013 shortly after her diagnosis. Fulfilling the mission of the Foundation, weekly trips are made to St. Luke’s Hospice to comfort grieving families with meals donated in part by generous Lehigh Valley Restaurants. Proceeds to date have ensured nearly 9,000 meals delivered to St. Luke’s Hospice house for those holding vigil. JAACF also provides cancer detection screenings for un-insured and under-insured individual, especially those with a high risk family history. Stay tuned for more news concerning this mission. AVAILABLE SPONSORSHIPS for our upcoming fundraising event at Blue Grillhouse located at 4431 Easton Ave., Bethlehem, PA on March 16, 2017. The Global Gala Dinner is set to be a tour of the senses and will feature a distinct international menu charted by Chef Patrick Barber and a wine tasting. The evening’s emcee is Ashley Russo, of Emmy winning Peak TV. A festive mix of music and culture promises to surprise. For more information or to secure your sponsorship, call Bob Agentis at 610.392.5460, email ba.jaacf@gmail.com, or circle your desired level and return with payment to the address listed below. JAACF is a 501 (c) (3) charitable organization and donations are tax deductible as allowed. 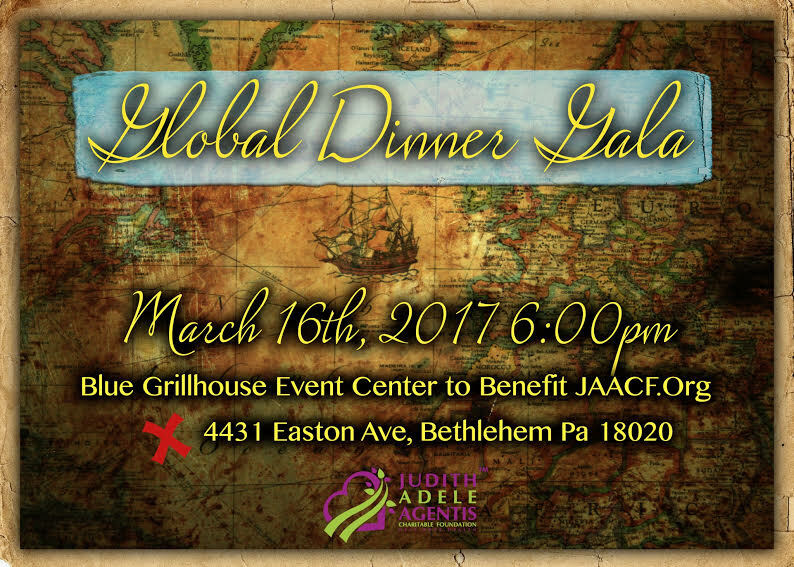 BETHLEHEM, PA (IMMEDIATE RELEASE) – The Judith Adele Agentis Charitable Foundation will present a “Global Dinner Gala,” at Blue Event Center, Thursday, March 16, from 6 p.m. until 10 p.m. 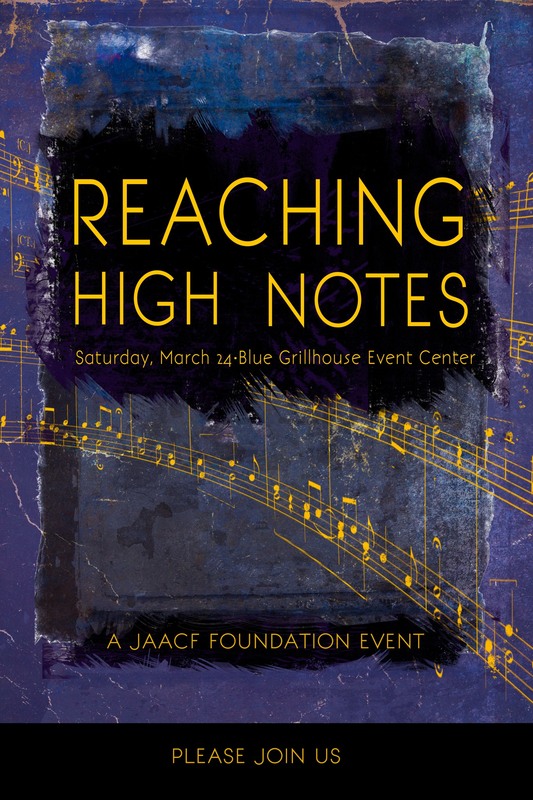 The evening will feature a menu created exclusively for JAACF by Blue Grillhouse Chef Patrick Barber. Guests will be treated to a tour of cuisine including Asian, Indian, Brazilian, Moroccan, and Portuguese styled grazing stations, specialty beverages, wine tastings, and entertainment from around the globe. http://bit.ly/2js1RQR. Or, email ba.jaacf@gmail.com for more info. Guests will be treated to an African drum circle, and international inspired fashion show including Guatemalan inspired contemporary looks. Mediterranean and Euro inspired tunes will be part of the revelry. Funds raised from the annual benefit will support, and ensure weekly hospice meal deliveries. To date, nearly 9,000 meals have been donated and delivered by JAACF volunteers to help comfort, and nourish family members holding vigil at St. Luke’s Hospice House. served more than2,500 meals to hospice patients and their families, Overall, have donated more than 8,000 meals since 2013.
supported health education and research for local organizations and the public through publicity, events and our annual fundraiser. Because of you, we did all this and more in 2016 alone and, on behalf of the patients and families you have supported, we simply say THANK YOU. The best gift you can give to loved ones this year is to encourage cancer screening and education. And, because of you, we are here to help if you need us. Visit jaacf.org to find out how we provide help and comfort during a most difficult time. Wishing you a safe, health and a very joyful new year. PopUp Happy Hour at Adagio will feature appetizers from Adagio, and beverage tastings. 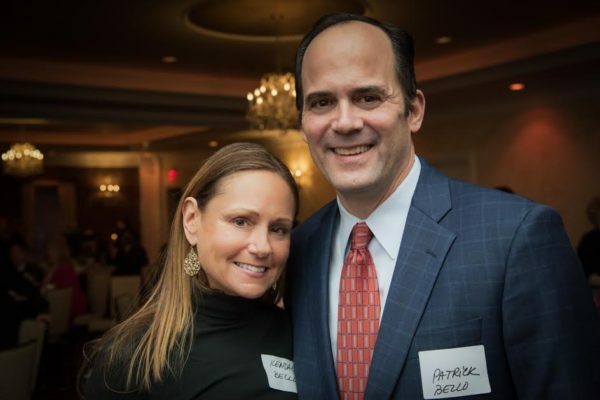 BETHLEHEM, PA (IMMEDIATE RELEASE) – A benefit Pop Up Happy Hour, hosted by the Judith Adele Agentis Charitable Foundation (JAACF), will be held Wednesday, November 16, 5:30 to 7 p.m. at Adagio Seafood Restaurant, 530 Pembroke Road, Bethlehem, PA.
Tickets are $10 per person and include Tito’s Vodka and Blue Coat Gin tastings from BreakThru Beverages, cocktails masterfully mixed by County Seat Spirits of Allentown, and wine tastings. 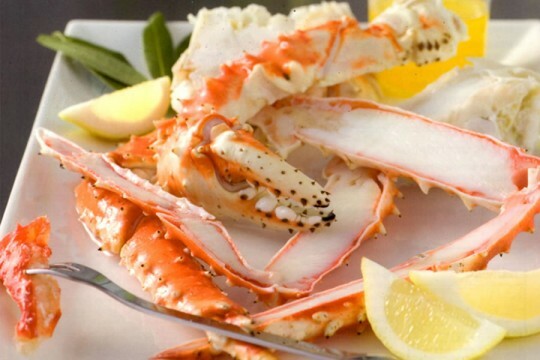 Appetizers will be provided by Adagio Seafood. A Chinese auction will be held to benefit JAACF’s mission to provide early detection screenings for the at risk, and the under-insured. November is Pancreatic Cancer Awareness Month, and information about early detection and testing will be available. JAACF provides weekly, nourishing meals to Hospice House. The Lehigh Valley based non-profit has donated more than 8,000 meals to families holding vigil for loved one’s at Hospice House of St. Luke’s, Bethlehem. For more information about the JAACF, established to provide meals to hospice centers and to provide testing, early detection, awareness and education about Pancreatic and Liver and Colon Cancers, visit www.jaacf.org, on Facebook /JAACF or Twitter @JAACF org. Tagged JAACF.org, Judith Adele Agentis Charitable Foundation; Early Detection of Pancreatic Cancer, Lehigh Valley Charity, Lehigh Valley Events, Lehigh Valley Non-Profit, Pop Up Happy Hour. Judith Adele Agentis Foundation | Powered by Mantra & WordPress.